The green sprout at far left. China’s miniature biosphere experiment has yielded a sprouting cotton seed, and it’s the first plant to germinate on the Moon—an important first step in creating a viable, self-sustaining lunar colony. 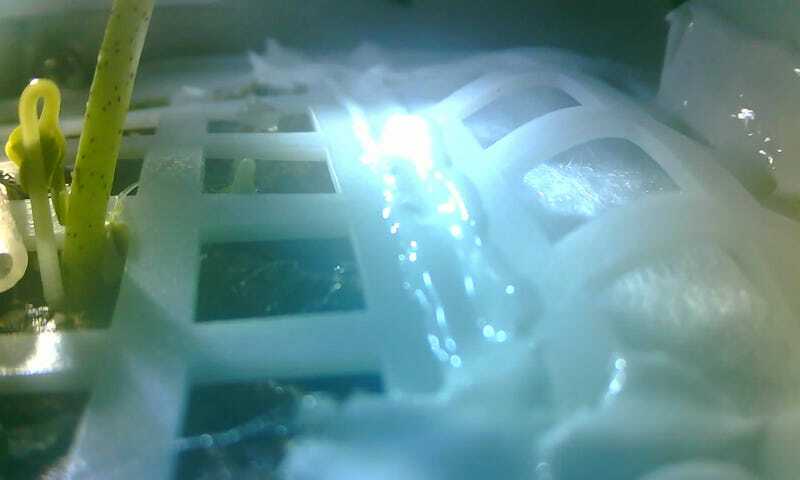 An image released today by the China National Space Administration showed green cotton shoots reaching upward from a lattice inside the canister, reports the South China Morning Post. It’s the first time—as far as we know—that a plant has germinated on a Solar System object other than Earth. That said, it’s not the first time a plant has germinated outside of Earth. In 2015, Expedition 44 astronauts grew—and then consumed—romaine lettuce on the International Space Station. Seeds brought to the Moon aboard the Chang’e 4 lander include cotton, rapeseed, potato, and arabidopsis (also known as rockcress). Of these, only the cotton seeds have germinated, for reasons that have yet to be determined. The seeds and fruit fly eggs were made dormant using unspecified “biological technology,” during the 20-day journey to the Moon, Xinhua reported. Once on the Moon’s far side, ground control commanded the lander to water the seeds. Xinhua said around 170 photos of the experiment have been captured so far. At least that’s the theory. Tests on Earth show that viable, self-sustaining biospheres are exceptionally difficult to build and maintain. That said, we shouldn’t be discouraged from such project. The Chinese effort is commendable, and the data gleaned from this project will be of significant value. Update: January 16, 2019, 8:35 a.m. ET: The plant has died, according to an updated Xinhua report. The sprout lasted for about a day, but on Sunday January 13, the Chang’e 4 probe entered into hibernation mode as the lunar night set in. With temperatures as low as minus 170 degrees centigrade, life in the canister “would not survive the lunar night,” according to Xie. The death of the plant, therefore, was not completely unexpected. Correction: A previous version of this post stated that multiple cotton seeds had sprouted, citing the South China Morning Post. A report from China’s official state-run news agency, Xinhua, notes that only one cotton seed sprouted. ISS Astronauts Just Ate the First Lettuce Grown in Space!